The dial has a gilt brass flat half-ring with a folding gnomon surmounted by a compass. The ring stands on a brass tripod, and the hour lines are engraved on the half-circle marking common hours from VI to XII to VI to the half-hour. On the other side of the half-circle is the signature 'HOC OPVS FECIT ALEXIVS SCHNIEPP VIENNA AVSTRIA'. Inside the half-circle is a round plate, engraved on the same side as the hour lines, with the length of the night and of the day, indicated respectively by 'QVANTITAS NOCTIS' and 'quantitas diei', both marked to the half hour from 8 to 16, with the times of sunrise and sunset indicated by 'oriens' and 'OCCIDENS'. On the other side of the round plate is a pierced lunar volvelle with aspectarium. 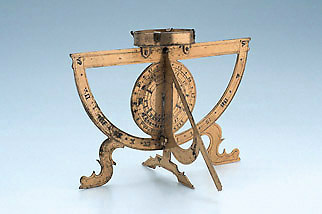 The compass (needle and glass missing) is soldered on the top and the names of the cardinal points are engraved as 'meridies', 'occidens', 'septen', 'oriens', along with an indication of the magnetic declination.